I remember back in the early 1990s there was a short lived Saturday Morning cartoon series based off the Dragon Warrior RPG video game series. Right away, seeing anything with the Dragon Warrior name on it was an automatic thrill for me as a kid. Wow. A cartoon based on the adventures Erdrick in his full blue armor? I was hooked before the opening title logo was done flashing and the intro song began. Now don’t get me wrong. That intro intrigued me, but also left me a bit confused. Mostly because the main character wasn’t wearing the traditional blue Erdrick armor that I associated with the game. Oh there was a blue armor, but it was worn by Dasiy, the female character of the series; which to a 13 year old boy in the early 90s, raised more questions than it probably should have. But regardless of the lack of resemblance it had to Dragon Warrior game I was familiar with, I still loved the show. The long form story, broken up into episodes, was an exciting change from your standard Saturday Morning cartoon show which (at the time) were a series of self contained episodes. Each episode of Dragon Warrior was a level, and you had to keep up in order to follow the adventure. The biggest letdown was that after thirteen episodes the series just ended. Boom. Just like that. The main quest was still left wide open and fans had to live the rest of their lives unsure of why it ended so abruptly. It was just one of those childhood mysteries that went unanswered. 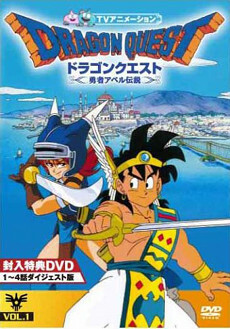 Years later I learned the US only aired a small portion of the entire series, known as Dragon Quest in Japan. The series went on for 30 more episodes, making a grand total of 43 episodes. And now, almost twenty fives years later I’m partially tempted to search out the series to give that young boy from the early 90s the satisfaction of FINALLY knowing how this quest ends.